Robin Huw Bowen (*7 June 1957, Liverpool, UK). The only full-time professional Welsh harpist specializing in the Welsh Triple Harp (Telyn Deires, engl. three-row harp) has introduced the Welsh instrument and its music to people all over the world. Robin Huw Bowen had learned to play the Celtic Harp while at school, inspired by Breton harper Alan Stivell. He was exposed to the more complicated Welsh Triple Harp by traditional music group Ar Log; brothers Dafydd and Gwyndaf Roberts had learned to play the instrument from Nansi Richards, the last truly traditional Welsh folk harpist. Although Robin regularly performs as a soloist, he has been a member of the Welsh super-group Crasdant since 1998. Peter Knight (*27 May 1947, London, England). As a child he learned the violin and mandolin before going to the Royal Academy of Music in the early 1960s. 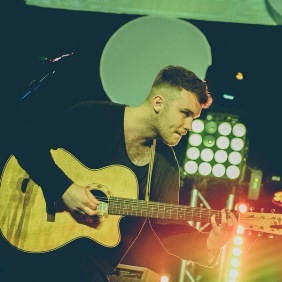 The recordings of Irish fiddler Michael Coleman inspired him to take part in Irish pub sessions. Peter Knight teamed up with guitarist and singer Bob Johnson until he joined the electric folk group Steeleye Span in 1970. In 2001, he joined some of the most accomplished folk fiddlers of England and Scotland who toured and recorded as Feast of Fiddles. Recently Peter has been concentrating on his trio Gigspanner, which features Vincent Salzfaas on percussion and Roger Flack on electro-acoustic guitar, playing a blend of folk, jazz and African rhythms. 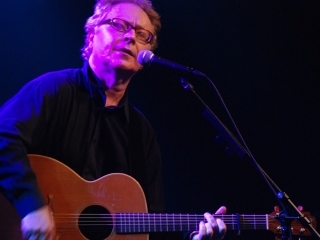 Paul Brady (*19 May 1947, Strabane, County Tyrone, Northern Ireland). During his time at college in Dublin in 1967, Paul Joseph Brady joined the popular Irish band The Johnstons. In 1974 he joined the highly influential Irish group Planxty. When Planxty disbanded in 1975, Brady formed a duo with Andy Irvine, before launching a successful solo career. His first solo album, Welcome Here Kind Stranger, was awarded the Melody Maker Folk Album of the Year in 1978 and saw him establish the reputation as one of Ireland's best interpreters of traditional songs. His versions of ballads like "Arthur McBride" and "The Lakes of Pontchartrain" were considered definitive. However, it would prove to be Brady's last album covering traditional material. He decided to delve into a more rock-inspired electric style with often poignant political lyrics. He released the first album of this genre in 1981, Hard Station. Paul Brady released a number of successful solo albums throughout the 1980s. He continues to tour, record and collaborate in a variety of projects around the world. Some of his most popular songs are: "Nothing but the Same Old Story", "The Island", "Paradise Is Here", the latter recorded by Tina Turner in 1986. 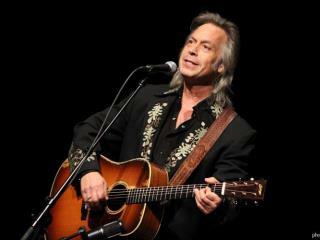 "5 Murder Ballads Where ..."
Jim Lauderdale (*11 April 1957, Troutman, North Carolina, USA). The country, bluegrass and Americana singer-songwriter James Russell Lauderdale has released 27 studio albums since 1986. His songs have been recorded by dozens of artists, notably George Strait, Elvis Costello, the Dixie Chicks, Vince Gill, and Patty Loveless. In 2016, Lauderdale was honored with the WagonMaster Lifetime Achievement Award. The term "the Jim Lauderdale Phenomenon", coined by singer-songwriter Kim Richey, is an ironic reference to the fact that Lauderdale was nominated for a Grammy for his collaboration with bluegrass icon Ralph Stanley but was released from a record deal not long after. In the 1990s, many country artists that were signed to major labels failed to get radio airtime and had their contracts dropped after making one or two albums. Emmylou Harris (*2 April 1947, Birmingham, Alabama, USA). Singer and songwriter Emmylou Harris has released many popular albums and singles over the course of her career and won 13 Grammys as well as numerous other awards, including induction into the Country Music Hall of Fame. She had dropped out of college and moved to New York City, working as a waitress to support herself while performing folk songs in Greenwich Village coffeehouses during the 1960s folk music boom. Her second album Elite Hotel (1975) was a No. 1 country album and also did well as a crossover success with the rock audience. Unusual for a country album at the time, which largely revolved around a hit single, her albums borrowed their approach from the album-oriented rock market. They were quite eclectic, especially by Nashville standards, including original songs, cover versions and also featured compositions by young songwriters whose talents Harris championed. In 1995, Harris released one of the most critically acclaimed albums of the decade, Wrecking Ball, produced by Daniel Lanois. It received virtually no country airplay, but it brought Harris to the attention of alternative rock listeners. In 2000, Harris joined an all-star group of country, folk and blues artists for the T-Bone Burnett–produced soundtrack to the Coen Brothers film, O Brother, Where Art Thou? In 2013 and 2015, she garnered Grammy nominations for duet albums with her former band member Rodney Crowell. In 2016, Harris was honored with a tribute concert, which featured several of Harris's closest friends and collaborators including Crowell, Patty Griffin, Lucinda Williams, Alison Krauss, Vince Gill and Sheryl Crow. Beverley Martyn (*24 March 1947, Coventry, England). 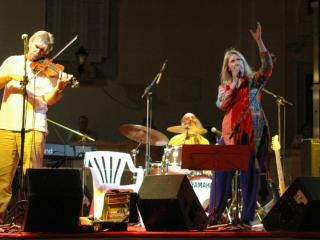 While still a student, Beverley Martyn (born Beverley Kutner) was picked to front jug band The Levee Breakers, who played the folk circuit in south east England. At the age of 16 she recorded her first single. Paul Simon invited her to New York where she contributed to the Simon & Garfunkel album Bookends. She later appeared at the Monterey Pop Festival. In 1969 she met John Martyn, whom she later married. As a duo they issued two albums; then Island Records persuaded John Martyn to resume his career as a solo artist believing there was more public interest in solo singer/songwriters. Although she was spending more time with her children, she continued to contribute to her husband's solo projects until the breakdown of their marriage in 1980. In 1998 she resumed her recording career with the release of the album No Frills. In 2013, she performed the song "Levee Breaks" at the concert A Celebration Of Bert Jansch at London's Royal Festival Hall. She had appeared in the photograph on the album sleeve of Bert Jansch's 1965 album It Don't Bother Me, where she can be seen lounging in the background. Ry Cooder (*15 March 1947, Los Angeles, USA). The multi-instrumentalist Ryland Peter Cooder is best known for his slide guitar work (he was ranked eighth on Rolling Stone magazine's 2003 list of The 100 Greatest Guitarists of All Time), his interest in roots music from the United States, and his collaborations with traditional musicians from many countries. In the early 1990s Cooder collaborated on two world music crossover albums, amely Hindustani classical musician V.M. Bhatt, tabla player Sukhvinder Singh Namdhari and African multi-instrumentalist Ali Farka Touré. In 1997, he produced the Buena Vista Social Club album, which became a worldwide hit and revived the careers of some of the greatest surviving exponents of 20th century Cuban music. Wim Wenders, directed a documentary film of the musicians involved, which was nominated for an Academy Award in 2000. 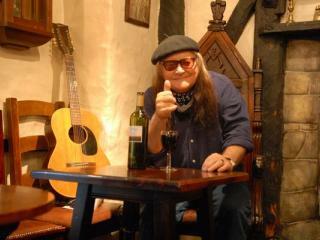 Meic Stevens (*13 March 1942, Solva, Pembrokeshire, Wales). The Welsh singer-songwriter is often referred to as "the Welsh Dylan". His songs have a mystical, psychedelic flavour. In 1967 he suffered a nervous breakdown and retreated to his home village to recuperate, where he started to write songs in Welsh in a concerted effort to create a distinctive national pop music. From 1967-69 he recorded a series of now rare Welsh-language picture sleeve EPs. Still largely unknown outside Wales, he can be found occasionally singing in certain pubs andhotels in Aberystwyth until the late hours. 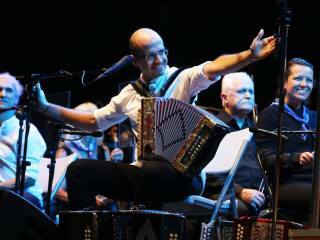 He can also be seen performing regularly throughout Wales and England and periodically in France, mainly Brittany, where he is very popular. Dónal Lunny (*10 March 1947, Tullamore, County Offaly, Ireland). 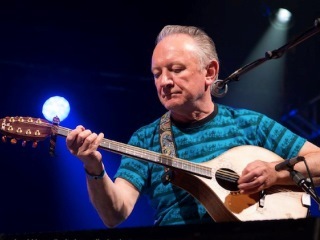 Irish folk musician and producer Dónal Lunny, who plays left-handed guitar and bouzouki as well as keyboards and bodhrán, has been at the forefront of the renaissance of Irish traditional music for over five decades. 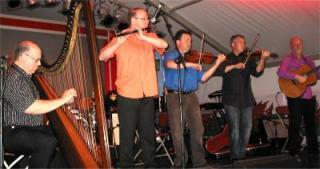 As a teenager, Lunny joined an occasional trio with his elder brother Frank and Christy Moore called Rakes of Kildare. In the late 1960s, he co-founded Emmet Spiceland who had a number 1 hit in Ireland with the single Mary from Dungloe. In 1970, Lunny formed a musical partnership with Andy Irvine. They played on Christy Moore's second album, Prosperous, which led the three of them, plus Liam O'Flynn, to form Planxty shortly thereafter. In 1974, Lunny left to form The Bothy Band, who had a significant influence on the Irish traditional music movement that continued well after they disbanded in 1979. In 1981, Lunny reunited with Moore to form Moving Hearts along with uilleann piper Davy Spillane, who combined traditional Irish music with rock and jazz. When Moving Hearts broke up in 1985, Lunny diversified and became a producer. He produced albums for Paul Brady, Elvis Costello, Indigo Girls, Sinéad O'Connor, Clannad and Baaba Maal. He collaborated with traditional singer Frank Harte and formed his own band, Coolfin. From 2002 onwards, Lunny and Irvine founded a multicultural band with Bruce Molsky, Nikola Parov and Rens van der Zalm called Mozaik. In 2012, he appeared on stage with LAPD (Liam O'Flynn, Andy Irvine, Paddy Glackin, Dónal Lunny), the latest grouping of players from Planxty. Usher's Island had morphed from LAPD and comprises Lunny, Irvine and Glackin, plus Michael McGoldrick (uilleann pipes, flute) and John Doyle (guitar). Dónal Lunny has some claim to popularising the bouzouki in Irish music after being presented an instrument by Andy Irvine. He ordered a custom-built bouzouki with a flat back instead of a traditional Greek rounded back from English luthier Peter Abnett. In 1981, he went one step further by creating an electric bouzouki. Rosalie was born in 1933, and this album is a recording of her farewell concert 69 years later in March 2002. And what a wonderfully warm hour’s listening it presents! Rosalie Sorrels is a woman who has known and sang with many of the leading lights on the American folk scene in over 4 decades. She is something of an icon to the American folkie. A solid singer and (especially) a storyteller of note. [...] Farewell concerts are seldom so splendidly memorable as this one methinks. The CD really does justice to a seminal figure of the American folk scene, and if you have nothing in your CD collection by her, this will plug a gap that really should be filled if you have any serious desire to be a bona fide student of the Folk scene on both sides of the Pond. Rosalie Sorrels (1933-2017). The “hillbilly Edith Piaf,” born Rosalie Ann Stringfellow, first came to widespread attention at the 1966 Newport Folk Festival, where she performed traditional songs from her native Idaho and Utah. She soon began writing her own material, about life on the road, her marital difficulties and the challenges of raising children (Rosalie left her husband and went on the road performing with her five children in the mid 1960’s). Rosalie broadened her scope to include social issues like prison reform, suicide prevention and women’s rights. She developed a storytelling approach, surrounding her songs with tales of her childhood and the early settlers of the West. As a singer, she was influenced by Billie Holiday, and her jazz-inflected phrasings often perplexed her accompanists. Rosalie's 2004 album My Last Go Round was nominated for a Grammy for Best Traditional Folk Album and was a musical journey through her 40-year career in folk music, featuring friends such as Jean Ritchie, Peggy Seeger, Christine Lavin and Loudon Wainwright III. She returned to the studio in 2007 to make a benefit album for Utah Phillips, who had congestive heart failure, Strangers in Another Country: The Songs of Bruce “Utah" Phillips. Rosalie Sorrels died in Reno, Nevada, on 11 June 2017. Vin Garbutt (1947-2017). His career has spanned over 40 years of constant world wide touring. 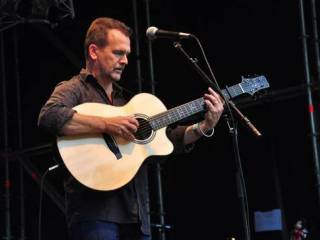 The last few years, folk singer and songwriter Vincent Paul Garbutt had been followed everywhere by film maker Craig Hornby for his documentary “Teesside Troubadour”. Craig had been interested in the influences that affect Teesside and found that Vin had been recognised as an ambassador for the area in the north east of England around the urban centre of Middlesbrough. Besides his gritty songs about North East England, the industry, the people and their values, a significant part of his repertoire consisted of protest songs covering topics such as the Troubles in Northern Ireland, unemployment, and social issues. Loudon Wainwright III. once said, "he really sticks his neck out and occasionally gets it kicked in, but this doesn't stop him!" Vin Garbutt had also been renowned for his hilarious intros; his rambling patter between songs could take longer than the amount of time singing. The world lost a great artist on May 21st; an indelible, unforgettable voice. Many of us in the folk/roots music world lost a great friend, too. I'm grieving for Jimmy LaFave, and for all my friends who are missing him as keenly as I am. Jimmy seemed like the one among us who'd stay out on the road forever, taking the blue highways instead of the interstate, always on the way to the next gig. I like to think he's still out there driving. He spent his last days out there with his band, singing until he couldn't sing anymore, going until his tank was on empty. And then he came home to Austin, and we loved him as much as we could until it was over. Godspeed my friend. Never is a moment that you are not on our minds. I struggle to describe the night of May 18th in Austin. It was much, much more than a concert - more like a great, joyful, tearful wake, only the deceased was still with us. As Ruthie Foster said, we got to give him his flowers while he was still here. For nearly four hours, we sang his songs, and some of our own, to him. Jimmy picked out the songs, the flowers, the photos, the program, the artists and speakers - everything. And although he arrived at the show in an ambulance, hooked up to an oxygen tank throughout, he managed to get onstage one last time to lead the several thousand people there in song. I can't describe what happened at the end of the show without breaking into tears. See for yourself. Jimmy died three days after the Austin tribute, on May 21, 2017. A few weeks before he passed away, I wrote a piece about him for The Bluegrass Situation, called "How It Must Remain". Jimmy touched my life in so many ways. A lot of people know that he recorded two of my songs, "On A Bus To St. Cloud" and "Revival"; fewer know that he, along with Tom Russell, urged his booking agent to sign me, which she did in 2004, and brought me into the extended Woody Guthrie family by inviting me to be a part of the Ribbon of Highway shows, and to sing with him in Okemah at the Woody Guthrie Folk Festival and at the Guthrie Center in Tulsa. I always loved singing with Jimmy, it was one of my great joys. I'll miss it, and I'll miss his sense of humor, his kindness and gentleness and goodness. And I'll forever be inspired by how he chose to live his life, especially in the last year. Jimmy LaFave (1955-2017). After moving to Stillwater, Oklahoma, singer-songwriter and folk musician Jimmy LaFave and a loose collection of songwriters crafted a musical style called Red Dirt music. Mixing blues, jazz, and country influences he began writing songs inspired by J.J. Cale, Chet Baker and Bob Dylan. LaFave became a disciple of the state's most famous folk musician: Woody Guthrie. LaFave was an Advisory Board member and regular performer at the annual Woody Guthrie Folk Festival. Prior to his death on May 21, the Oklahoma Music Hall of Fame announced that LaFave would be one of several musicians inducted into the Hall of Fame. Lonnie Brooks (1933-2017). Blues guitarist Lonnie Brooks, born Lee Baker Jr, died on April 1, 2017 at the age of 83. In 1959, the great Sam Cooke suggested his move to Chicago. He soon landed a job as a sideman with Jimmy Reed. Brooks created an instantly recognizable signature sound. It combined Chicago blues, rock ‘n’ roll, Memphis soul, Louisiana grooves and country twang into a style that his fellow musicians called "voodoo blues." In 1998, he appeared in the film Blues Brothers 2000, and co-authored the book Blues For Dummies. Lonnie Brooks was inducted into the Blues Hall Of Fame in 2010. James Cotton (1935-2017). “Mr. Superharp” had toured worldwide for over 60 years, recorded nearly 30 solo albums, winning one Grammy Award, six Living Blues Awards and 10 Blues Music Awards. He was inducted into the Blues Hall Of Fame in 2006. Born on a cotton plantation in Tunica, Mississippi, James Henry Cotton was a working musician by age nine. He learned harmonica directly from Sonny Boy Williamson II, toured with Williamson and Howlin’ Wolf, and recorded for Sun Records in 1953 before spending 12 years touring and recording with Muddy Waters. He was featured on Muddy’s classic 1960 At Newport LP, including the iconic version of Got My Mojo Working. In 1966 he formed The James Cotton Band (featuring outstanding musicians including famed guitarists Luther Tucker, Matt “Guitar” Murphy and Hubert Sumlin) and quickly rose to the top of the blues and rock worlds. Frank Murray (1950-2016). On 22 December 2016, Frank Murray, who spent much of his career in the United States working in theatre and film (Eat the Rich), passed away in Dublin of a suspected heart attack, aged 66. He had been former manager to Thin Lizzy, Elton John, The Pogues and The Frames. Murray is widely credited for helping put together The Pogues' hugely successful Christmas ballad Fairytale of New York in 1987. As Spider Stacy recalled, Murray had brought in The Band's "Christmas Must Be Tonight" and suggested they cover it. But the idea was met with disinterest, so he challenged lead singer Shane MacGowan to write a better holiday song. Murray had also worked with Kirsty MacColl and helped bring her to record the duet. At the cremation at Mount Argus church in Harolds Cross, Dublin, Finbar Furey played The Lonesome Boatman and The Lost Brothers performed Who Could Love you More. Seán Boylan sang Ave Maria and Nearer My God to Thee. Pete Cummins performed All My Tears, Mary Stokes sang The Foggy Dew followed by Glen Hansard who sang A Rainy Night in Soho by The Pogues. Guitarist Philip Donnelly performed Drift Away. Concluding, Phelim Drew sang The Parting Glass. Among those in attendance were Stephen Rea, Bob Geldof, Eamon Carr (Horslips) and Shane MacGowan. The 59-year-old Pogues frontman was looking frail and grief-stricken as he was helped out of a car and into a wheelchair, himself having lost his mum just days ago. At Ards International Guitar Festival, Sarah McQuaid was presented with the festival’s annual Lifetime Achievement Award. Previous recipients over the festival’s 20-year history include legendary guitarists Davey Graham, John Renbourn, John Martyn, Arty McGlynn, Martin Simpson, Gordon Giltrap, Pierre Bensusan and Martin Carthy. Sarah recalls her initially annoyed reaction when compère Ralph McLean of BBC Radio Ulster and festival director Ernie McMillen of Avalon Guitars came out to present the award: “I’d just finished my set and left the stage, and the crowd was calling for an encore, but before I could come back out from the wings, Ralph McLean and Ernie McMillen walked onstage and started talking about the Lifetime Achievement Award. “I just thought, ‘Oh, rats, now they’ll bring out some big-name guitarist to accept this bloody award and I won’t get to do my encore!’ Never in a million years did I think it would go to me. I was totally and completely floored. It’s a very, very big deal to be placed on a level with so many of my musical heroes.” And she did get to do an encore after all, performing a cover of Ewan MacColl’s ‘The First Time Ever I Saw Your Face’, which she also recorded on her fourth solo album Walking Into White (Waterbug, 2015). 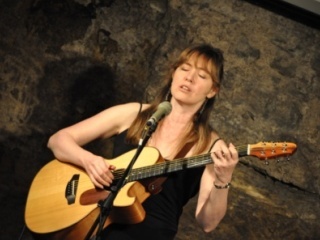 Sarah McQuaid is currently hard at work writing songs for her fifth solo album, to be produced by folk icon Michael Chapman and released in 2018 (once again on the US-based Waterbug label) with album launch tours in the UK, Ireland, Continental Europe and the USA. She also hopes to pen a sequel to The Irish DADGAD Guitar Book, the popular tutor she authored on the alternative guitar tuning she uses exclusively – originally published in 1995 and still the standard reference on the subject, selling worldwide through Novello & Co./The Music Sales Group and Hal Leonard Corp. 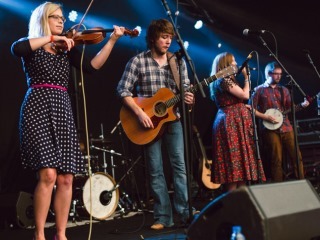 This year’s 6th edition of the Folk East Festival in Suffolk in East Anglia promises to be once again a highlight of the British folk circuit. The line-up is once again mouthwatering, and includes a plethora of BBC Radio 2 Folk Awards winners and nominees including folk legend Jon Boden, Sam Kelly & The Lost Boys, Lau, Nancy Kerr playing at the festival with Andy Cutting and Martin Simpson, and Nineborrow. For an international touch, there’s top Irish band Beoga (recently also in pop circles a household name, having been backed the chart topping song “Galway Girl” by Suffolk’s own Ed Sheeran) and Ireland’s Damien O Kane, and to go further afield, Basque band Korrontzi and Slovenians Terrafolk. And if the music is not mouth-watering enough, the wonderful range of Suffolk food is certainly moutwatering too. Often described as unique in its family friendly village fair atmosphere, this is a festival not to be missed. Head to the beautiful grounds of Glemham Hall near the gorgeous Suffolk coast, on 18th, 19th & 20th August 2017, to join in the fun. Folk at the Froize, in East Suffolk in the UK, has established itself a very special reputation amongst folk musicians – David Grimwood’s monthly folk series is well regarded as an intimate folk music venue with a buffet of delicious tapas included in the ticket price. But now Folk at the Froize goes large – in addition to the monthly concerts at the Froize Inn. The very first “Folk on the Farm” at Wantisden Valley, on 20th October 2017, will feature the brilliant duo Greg Russell and Ciaran Algar, supported by great Cambridge based The Willows – food included. And a month earlier, there’s “Folk at the Theatre” organised by Folk at the Froize, bringing you the masterful music of Sam Kelly and his cheeky band of friends on Friday 22nd September 2017, supported by favourite Norwich based trio Alden, Patterson & Dashwood. 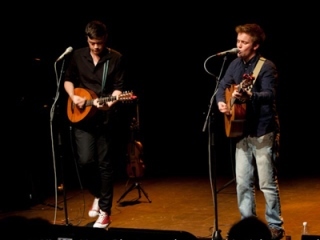 Two double acts not to be missed – and Folk at the Farm and at the Theatre might well become regular features on the Suffolk scene.